I went for a run today. 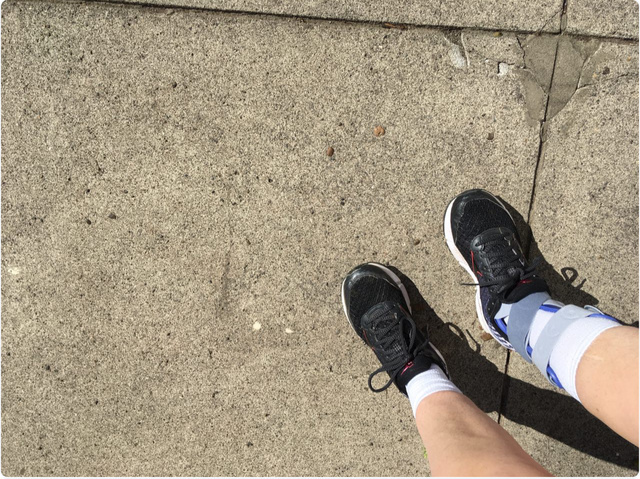 It was the first run I've done since I sprained my ankle, and was a test run to see how my rehab is going. I wanted to run from my place up to the gardens then back, but I knew that would definitely be too much. So, I chose a run uphill to the "bottom" of the gardens hill (read: where the buildings end and the forests begin), and back. I figured the run would take me about fifteen minutes including stops, be uphill out and downhill back. I was pretty good about the time estimate. After the run, I did my normal rehab: alphabets, presses, balancing. My ankle HURTS now. By a lot. I worry I might be pushing the ankle, too much too soon. The brace protects it from further damage, and I moved slowly. I might need to spend more time on the elliptical, but I dislike that machine so much. We'll see. The half marathon in November isn't happening, that's for sure.